Hard water is water that contains a lot of calcium or magnesium. Homes in hard water areas find that they get a lot of calcium build up in their pipes and appliances, such as in kettles. These deposits can slow down the flow of water through your pipes and can also interfere with the conduction of heat through the kettle element. In short it makes your system and appliances less productive. Calcium also reacts badly with soap products to form a scummy residue which is unpleasant. How will a Water Softener help? 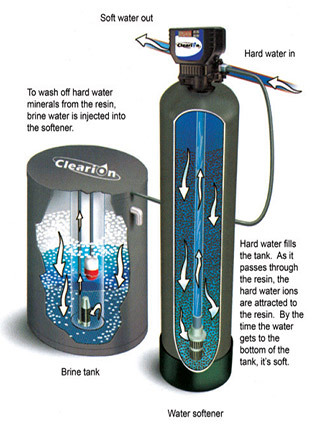 A water softener simply replaces the calcium and magnesium ions with sodium ions. Sodium does not form any sort of deposit in pipes or appliances, and neither does it react with soap, meaning that the newly ‘softened’ water is free to flow with no hindrance. As Wiltshire is a hard water area, many homes are finding the benefits of fitting a water softener.